During the night between 23rd and 24th of August 2017, I went observing to Ulvila Observatory. During this night, I was able to observe two objects, both planetary nebulas: NGC 6772 and 6804. During the Night I was at the observatory with Jarkko Suominen. He was photographing The Veil Nebula in Cygnus, and during the night I was able to do couple of visual observations during the breaks of his exposures. 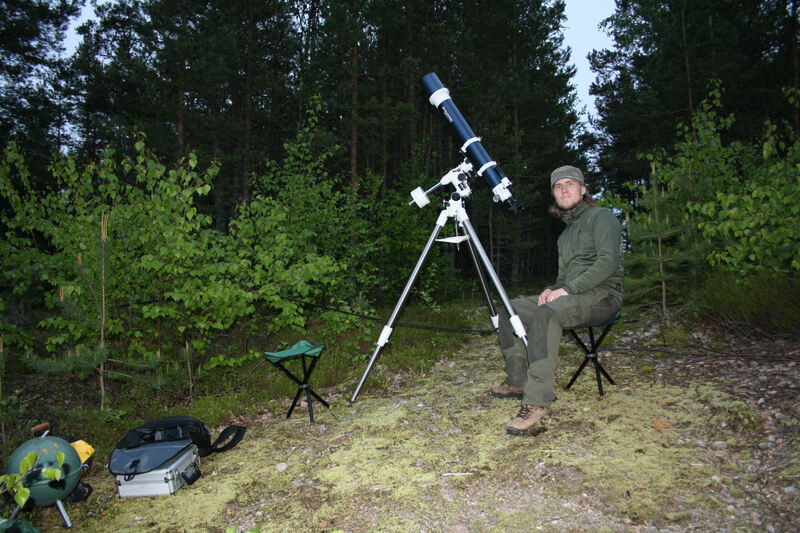 Besides my visual observations, I was also participating astrophotography activities with Jarkko that night. A report of the Veil nebula photography session can be found in Taivaanvahti observation database by Ursa Astronomical Association (in Finnish). @165x: This planetary nebula appeared as a roundish, and faint nebulous glow with even brightness distribution. No central star or structure visible. OIII enhanced the view, this nebula doesn’t tolerate magnification very well. @280x: This planetary nebula appeared as a rather small, and pretty bright nebulous patch of light. The shape of the nebula is perhaps slightly elongated. Central star became visible with higher magnification. OIII didn’t do much with this object. So, that was my second, this time very short observing session. I was happy anyway, because I was able to see two new planetary nebulas for me, and both of them were really pretty objects! This night was my last observing session in March 2017 and in observing season 2016-2017. During this night, I observed several galaxies in Leo, and I was able to finish Leo constellation in Herschel 400 observing list. During the night, I was observing in Ulvila observatory, and conditions were relatively good in terms of the site. @165x: two galaxies in the field, NGC 3640 and 3641. NGC 3640 is the brightest and more dominant of these two. NGC 3640 appears as a bright, oval-shaped, diffuse glow of light with bright non-stellar core, long axis in W-E orientation. NGC 3641 appears as a small, roundish, featureless and faint nebulous patch slightly SE from NGC 3640. @165x: this galaxy appeared as a rather faint, roundish and diffuse patch of light, the galaxy has a faint core, which doesn’t stand out much. @165x: this galaxy appeared as an elongated, oval-shaped glow, the galaxy has a rather bright core, long axis in N-S orientation. @165x: rather bright, oval-shaped, elongated galaxy, rather bright core, long axis in N-S orientation. @165x: this galaxy appears as a faint, diffuse, nebulous and featureless patch of light. This galaxy is elongated and thin, long axis in N-S direction. So, that was it! My last observing session in March 2017 and last in observing season 2016-2017. Now I had finished Leo constellation on Herschel 400, and I could tick off that constellation from the list! This observing season had been also quite productive, I was able to more than 80 observations during the season! In late season during spring of 2017, I was having quite busy and hectic season again in my life, and that hindered my observing to some extent. I had to terminate the observing season prematurely partially because of that. But all in all, I was quite satisfied with my observing season! I might later publish a more detailed insight to my observing season statistics. But at least I’m going to keep some time off from observing because of the mandatory summer break that we northern deep sky observers have. The skies are already very light, and it’s only about 3 weeks to summer solstice! Enjoy the summer, and have good time! See you again in Autumn of 2017! During this night I was again at Ulvila observatory. During the night, there was again the weekly club meeting of Porin Karhunvartijat. After most people had left, I stayed at the observatory with couple of my astro friends. We were casually observing some common objects, and I was able to do one proper observation. This time I observed NGC 4151 and 4156 in Canes Venatici. @165x: two galaxies in the field: NGC 4151 and 4156. NGC 4151 is the brightest of these two, it is rather bright and slightly oval-shaped, the galaxy has a bright, stellar core. NGC 4156: this galaxy appears as faint, diffuse featureless patch of light. After having observed NGC 4151, I had observed every galaxy in Canes Venatici that are listed in Herschel 400! This observing session was my third in March 2017 and second last in season 2016-2017. So I still had one more observing session before summer break. I’ll write more about that later! This night was my second observing night in March 2017. During the night, I was observing in Ulvila observatory. Conditions were pretty average in terms of the site. During the night, I observed four galaxies in Leo, all listed in Herschel 400 observing list. @165x: rather bright galaxy with bright, almost stellar core. The galaxy is elongated, long axis in SW-NE orientation. @165x: rather bright galaxy, elongated, with bright, almost stellar core. Long axis in NW-SE direction. @165x: a rather bright, elongated galaxy with bright, almost stellar core. Long axis of the galaxy is in SW-NE orientation. @165x: an elongated, rather bright and thin galaxy, apparently in edge-on position. Long axis in W-E orientation. Center of the area slightly brighter than outer parts. So, that was my second observing night in March 2017. After this session, I was still able to do observing couple more times before mandatory summer break from observing. During this evening there was the weekly club meeting of Porin Karhunvartijat in Ulvila observatory. Because of this, I wasn’t totally alone, and I could do only one observation. This object was NGC 5474. @117x: this galaxy appeared as a very faint, elongated glow, it appears to be elongated, long axis appears to be in SW-NE orientation. Homogenous brightness distribution, no visible core. NGC 5474 observed with 11” Catadioptric. So that was my second and last observing session in February 2017. There wasn’t many observing sessions or observations in February, but in March I was observing during several nights and I was able to made quite lot of observations! I’ll be posting more about my observations in March 2017 later! This was my first observing session in year 2017. During this session, I made four observations, all observed objects were listed in Herschel 400 list. Conditions were relatively good considering the season. @117x: faint-starred open cluster, which is moderately detached, the cluster is mostly visible as a starglow, some individual stars were visible. @165x: this famous nebula is known as Hubble’s variable nebula, it appeared surprisingly large and bright, the shape is clearly wedge-like or comet-like, the nebula extends northwards from star R Mon. The star R Mon is like the nucleus of the comet, and the nebula is like the tail of the comet. The nebula was easily visible without filters. Nice object! @117x: This nebula was poorly visible in these conditions. The nebula appeared as a very faint, diffuse glow of light slightly east from Mintaka. The nebula was weakly visible without filter, UHC filter enhanced the view slightly. The nebula was visible all the time only with averted vision and sweeping. This observation left me hungry for more, and I need to observe this one again in better conditions! @117x: a rather scattered, poorly concentrated, poor open cluster. The cluster is weakly detached, with OIII filter I suspected very faint nebulosity around the brightest star of the field. So know I had finished this observing session. There were two objects, that left me a little bit unsatisfied because of poor observing conditions. These objects were NGC 2024 and NGC 2174/2175. I need to re-observe these objects during next season! After this, there was one more observing session in January 2017. More about that later! This observing session was my third and last in December 2016, and it was also my last session during year 2016. This session was interrupted prematurely by clouds, and I was able to observe only to objects. These objects were galaxies listed in Herschel 400 -observing list, one of them in Cetus and another in Ursa minor. @165x: this galaxy appeared as a faint, oval-shaped glow with uniform brightness distribution. Long axis appears to be in W-E orientation. No core visible. After having observed this galaxy, I had observed all Herschel 400 objects in Cetus, and I could finally check that constellation finished on my observing list! @165x: this galaxy appeared as a relatively faint glow with uniform brightness distribution. In the center, there is a relatively bright, stellar core. The galaxy is elongated, long axis appears to be in N-S orientation. So, now I had been able to observe two objects during this session, but then clouds were coming an I was forced to stop observing. Next observing sessions happened January 2017, I’ll be writing about them later!